From that moment on there will simultaneously occur several events which, despite or perhaps precisely because of their apparent incoherence, constitute a virtually homogenous and coherent whole. 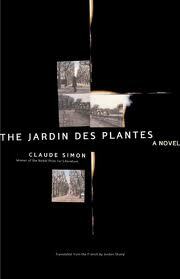 One of the presiding motifs in Claude Simon’s The Jardin des Plantes is the image of a man – the author, thinly disguised as “S.” – looking in a bathroom mirror and examining himself, the objects in front of him, and the things he sees behind him over his shoulder. As S. playfully makes the mirror image of the room and objects behind him disappear and reappear simply by moving his arm or shoulder, these scenes subtly comment on the nature of autobiography. At the core of The Jardin des Plantes is a single life-changing event. Over and over S. revisits the fateful days of early May 1940 when his meager, antiquated cavalry unit was quickly overrun by the advancing German army, leading to his capture, imprisonment, torture, and eventual escape. As he revisits his own numerous memories, the recollections of others, the published record, and the archival evidence he has unearthed of the events of those days, the end result is not a definitive story, but a rich, contradictory holographic recreation that presents a different perspective from every angle. But above all else, there are pages of achingly beautiful writing. The Jardin des Plantes features in the early pages of W.G. Sebald’s Austerlitz. I wrote recently about Austerliz, Simon and Gastone Novelli. In W.G. Sebald’s Austerlitz, during the first extended meeting between the narrator and Jacques Austerlitz, the two men stop for coffee at Antwerp’s Glove Market and discuss, among other things, the long architectural history of fortifications. “It is often our mightiest projects that most obviously betray the degree of our insecurity,” Austerlitz remarks. He then proceeds to talk about how the star-shaped dodecagon came to be seen as an ideal defensive shape in spite of the fact that, in real warfare, these fortresses turned out to have many disadvantages. Furthermore, their complexity led to the fact that they were often obsolete by the time their construction was completed. The day after this conversation, the narrator takes a short train ride to visit Breendonk, one of numerous fortresses constructed at the beginning of the 20th century for the defense of Antwerp. Breendonk, along with Antwerp’s entire fortress system, had proved utterly useless against Germany’s offense during both World Wars and it was subsequently converted into a museum of the Belgian resistance. During the Second World War, Breendonk, built for the defense of Belgium, was instead used by the invading Germans as an infamous prison where many Belgians and others were tortured. At this point in Austerlitz, as his narrator wanders through the fortress, he recalls two related stories of torture: Jean Améry’s account of being tortured at Breendonk (I presume this account is from Améry’s At the Mind’s Limits: Contemplations by a Survivor of Auschwitz and Its Realities), and Claude Simon’s novel Le Jardin des Plantes, where Simon tells the story of Gastone Novelli, who had been similarly tortured (albeit at Dachau). Upon his liberation, Novelli fled “civilization” for remote parts of the Brazilian jungle, where he lived with a small tribe whose language consisted “almost entirely of vowels, particularly the sound A in countless variations of intonation and emphasis” (to quote from Austerlitz). When Novelli returned to Europe, one of the recurring themes of his paintings became the letter A, often “rising and falling in waves like a long-drawn-out scream,” as Sebald put it. 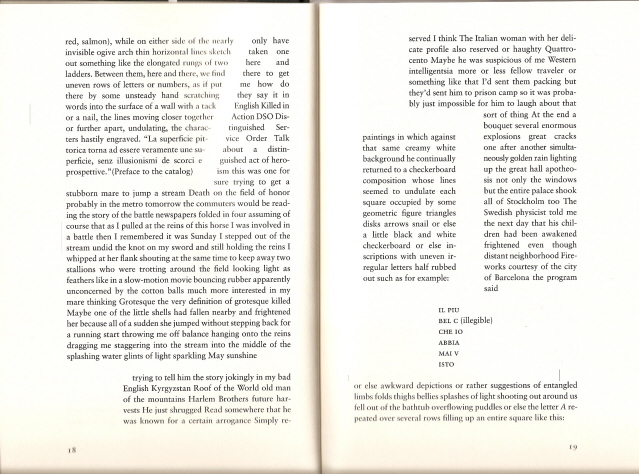 It is curious to see how the two books typographically depict this string of As. 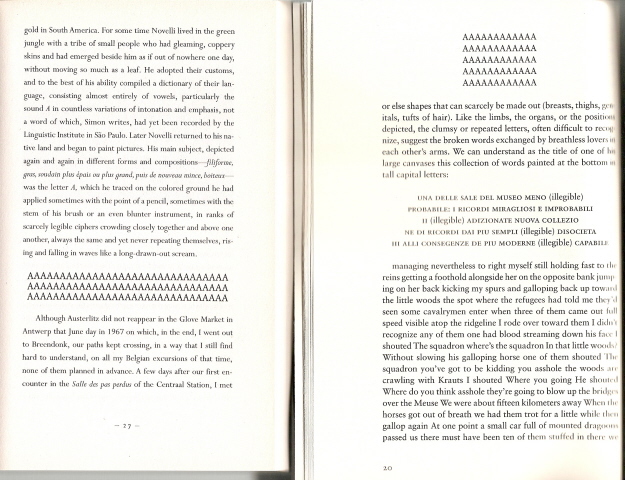 In Sebald’s Austerlitz, on the left, the run of vowels is elongated into what could be a multi-row scream. On the right we see how Simon’s The Jardin des Plantes (as it is called in English) turns the As into a tidy, block-like structure that strikes me as more visual than verbal. The Italian painter Gastone Novelli (1925-1968) is little known in the US. 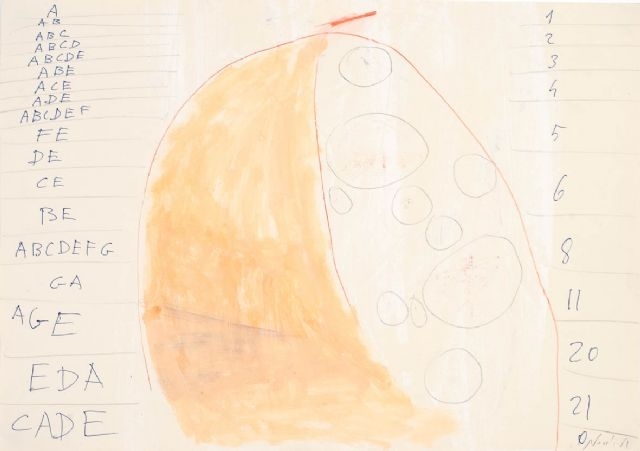 His work is likely to make many viewers immediately think of Cy Twombly, who moved to Italy in 1957, but the resemblances turn out to be fairly superficial. I had never given Sebald’s reference to Novelli much thought until I ran across this excellent short essay by Rafael Rubinstein over at The Silo, a site that he describes as “a personal, revisionist ‘dictionary’ of contemporary art…to challenge existing exclusionary accounts of art since 1960 and to offer a fresh look at some canonical artists.” The whole site is well worth exploring. Claude Simon, The Jardin des Plantes. Northwestern University Press, 2001. Translated by Jordan Stump.